If you’re planning a trip to Walt Disney World or Universal Studios in Orlando with young children, then you need to know about Child Swap. No, I don’t mean that you get to swap kids with random strangers (although at times you might feel like it!). If you have a child who is too small (or too scared) to ride an attraction, then go to the attendant and tell them that you want to do a Child Swap. One parent will wait with the younger child, while the other parent takes the older child on the ride. When the ride is over, the parents meet back together and swap kids. Since you’re doing the Child Swap, both parents get to experience the thrill of riding with their child, you only have to wait in line once, and your riding child gets to go on the attraction twice (once with each parent)! Sounds cool right? Well, it is! But there are some differences between the Child Swap programs for Disney World and Universal that you should know about before you travel. For me, Disney is the clear winner. At Disney, you go to the attraction and the non-riding parent is given a Child Swap ticket. Then the riding parent and child get in line while the non-riding parent and child go off to explore the park. With my non-riding kids, we often ride something that is geared towards younger kids while we wait. Or we take advantage of one of the many toddler friendly waiting areas or shows to pass the time. Then we meet together for the swap keeping the younger non-riding child entertained and happy the whole time. At Universal, on the other hand, the whole family has to wait in line (including the non-riding child). Sometimes this can be up to an hour, and many of the rides have some pretty scary lines (think Mummy)! When you finally make it to the front of the line, the non-riding parent and child are escorted to a small holding room where they sit (or stand because the room is TINY) until the riding parent and child come for the swap. If your toddlers are anything like mine, you can imagine how hard it is to explain to them that they are going to have to wait in a line for one hour and then NOT get to ride! The poor kids even have to watch their family members get on the ride before they are ushered to their holding cell room. It was torture! If we had gotten a Child Swap ticket like you do at Disney then we could have taken the younger child to any of the toddler themed areas at Universal while we waited, and they would have had a blast. But that’s not how it works at Universal. And that’s why Disney wins the Child Swap battle in my book. Hands down. 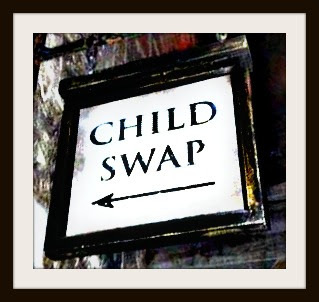 Thank you for writing about both child swaps. I write a blog called http://www.disneywithchildren.com about traveling to DW with children. I was planning on going to Universal in Dec but may rethink that now hearing how their child swap works! When we did it at Epcot my toddler got to see the movie Circle of Life while I waited on line and then rode Soarin. Then I took her to see it again, her request, while my mom went! Enjoyable for us all! Just last week my toddler rode Living With The Land three times (happily) while we did rider swap at Soarin! We hit Circle of Life too, but that was because of a downpour (and needing a dry place to hang out for a while). We’ve been making annual trips to WDW for more than ten years and this was our first year to venture out into the world of Universal/Islands of Adventure with our four kids. We still did all Disney parks, but added those two Universal parks as well. Most of the rides at Universal were geared towards kids over the age of ten, so my two youngest kids were not that impressed with having to wait in lines with very few rides that they could actually enjoy. My older kids LOVED it though, so it really depends on the age of the children you are bringing. I was shocked about the rider swap system and wish I had known more about it before I went. I probably would have packed more fun things to do for my toddler while she waited (or not gone at all with her!). But I know I’m a biased Disney fan having visited there so many times (see my posts Top Ten Reasons We Pick Disney and Traveling to Disney With An Autistic Child). I’m planning a few more posts on Disney vs. Universal, so stay tuned! Love your blog and all the help that you are giving to those taking their kids to Disney!